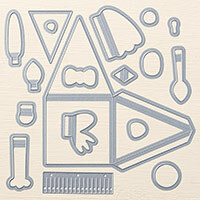 I was on the fence about ordering the Playful Pals Stamp Set and coordinating Pyramid Pals Thinlits Dies. But after seeing some great samples by other Stampin' Up! Demonstrators and watching this video I knew I couldn't resist it any longer. My grandchildren will have a lot of ideas for me too with the animals I can create for them, and with another grandchild born just two weeks ago, I know I will put this to good use. I can see me creating a lot of cute animals with the stamp set all by itself, but can take it to the next level with the Thinlits. 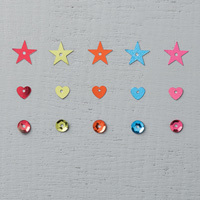 Great for birthday parties, baby showers, classroom gifts, and so much more. I will be getting my bundle next Monday and will post some of my own creations at a later date, but for now I hope you enjoy the video and see how fun putting together these cute animals can be. Note: I am showing the products as a bundle to save you 15%, and also individually since they can be purchased both ways depending on your needs. 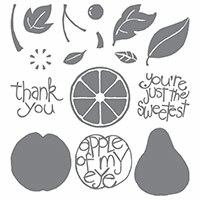 I knew when I saw the "Apple of My Eye" Stamp Set in the Occasions Catalog that I would want to use the Farmers Market Designer Series Paper with it. 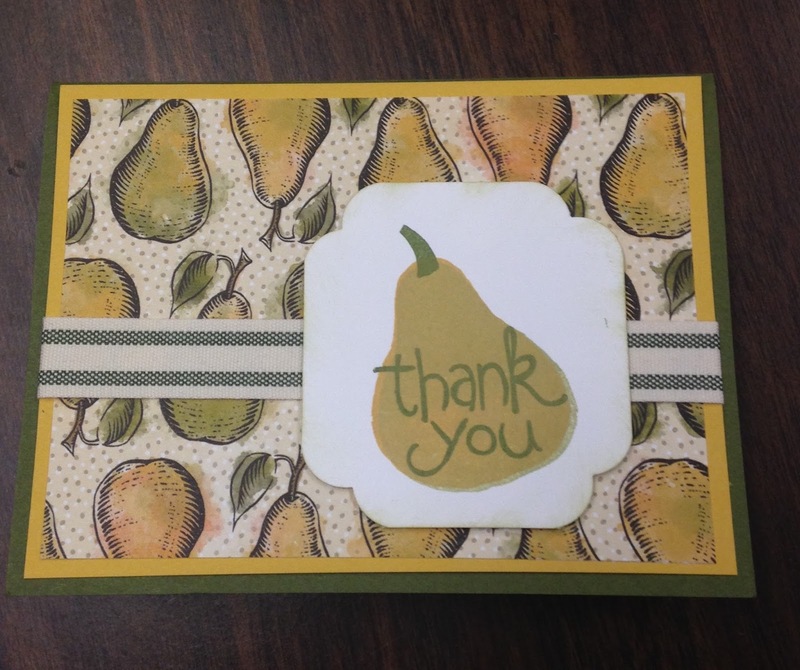 The pear in the paper goes nicely with my stamped image and the inside sentiment makes it all go together nicely. I used Mossy Meadow and Hello Honey Card Stock and ink which coordinated with my paper, and also added a piece of Mossy Meadow 5/8" Striped Cotton Ribbon under my stamped pear. I love when I can combine products out of all of the catalogs, and that is what I did for today's card. 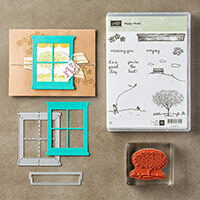 The Stamp Set is from Occasions Catalog, the Framelit is a returing product from the Holiday catalog, and the Designer Paper is from the Annual Catalog. My card base of Soft Sky Card Stock was layered with a piece of Crumb Cake Card Stock and Color Me Irresistible Specialty Designer Series Paper. 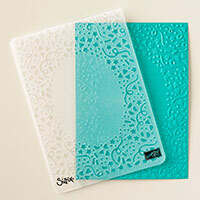 I sponged the Designer Paper with Soft Sky Ink to make the rain drops on the embossed paper stand out. 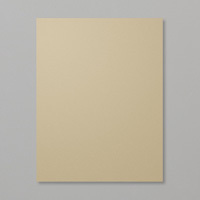 This paper has 6 sheets of white embossed paper with 6 different designs, and 6 of the sheets come in 6 different colors, and all of the sheets have an embossed look. 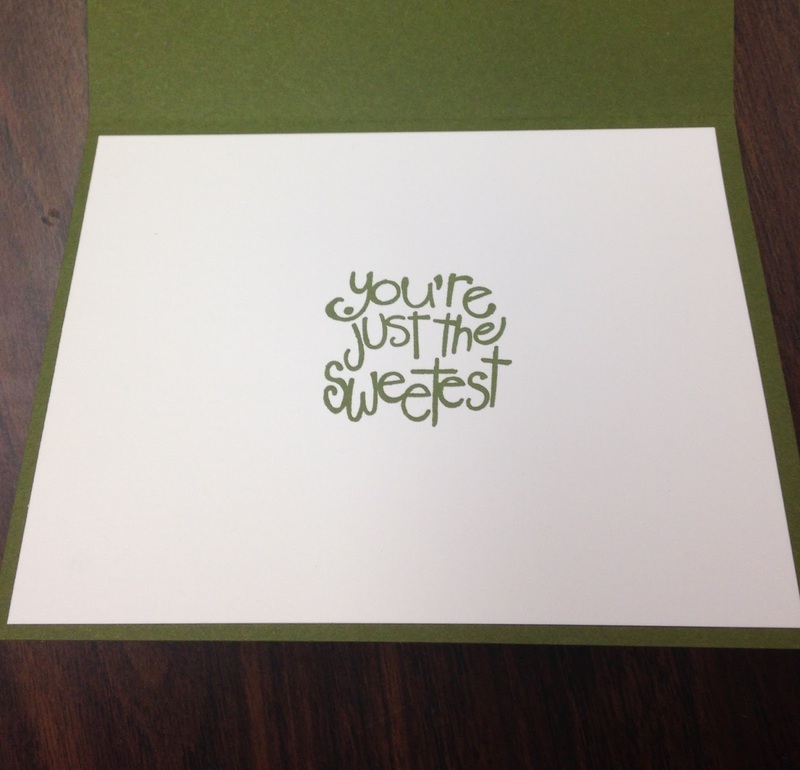 I then stamped my image onto this paper using Crumb Cake Ink, and then cut out my framelit and added my sentiment. Note - The Stamp Set and Framelit can be purchased as a bundle to save you 15%. If you already purchased the Framelit in the Holiday Catalog, just purchase the stamp set by itself and do not use the bundled number I have listed below. 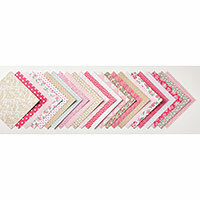 A fun kit for Valentine's Day Treats, or banner, or you could also think outside the box a bit and use the hearts and embellishments to decorate cards, scrapbook pages, or fun projects. Here is the video Stampin' Up! 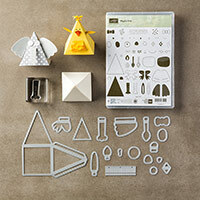 created to show you how easy it is to put together. And, remember during Sale-a-bration the 3 month Prepaid Paper Pumpkin Subscription is on sale. Save on a 3-month prepaid subscription and instantly qualify for a FREE Sale-A-Bration item! Take it to the next level with a 12-month prepaid subscription. Save $24 a year with the everyday awesome price, earn Stampin' Rewards, and instantly qualify for 4 FREE Sale-A-Bration items! This offer will end on March 31, 2016 at 11:50 PM. You can click the Paper Pumpkin link in the left hand column of my blog to sign up. Have any questions about My Paper Pumpkin, just send me an e-mail and I will be happy to help. 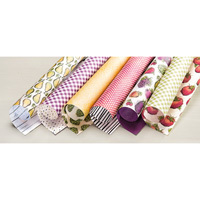 I can also help you come up with some alternate ideas for the kit to make it suite your specific needs. Party Pop Up Thinlits Die Video by Stampin' Up! We made a card using this Thinlit Die at my stamp class this week, but I don't have time to post it today. 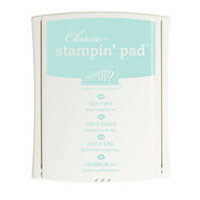 So, instead I thought you would like to watch this video by Stampin' Up! to show you how way to use this die. 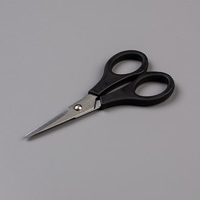 It can be used to pop out the middle of your card, or you could cut it all the way out and layer it on your card or project. I hope you get inspired. I might not post again for a few days. Unfortunately very good friends lost their daughter yesterday. The family is really struggling with the loss of their very beautiful 31 year old daughter who died a week after being in a car accident. I will be spending time supporting the family in their time of such tragic loss and will be back posting when time permits. Needless to say, it's been a challenging two months. I lost my dad last month, and now I have to say goodbye again. 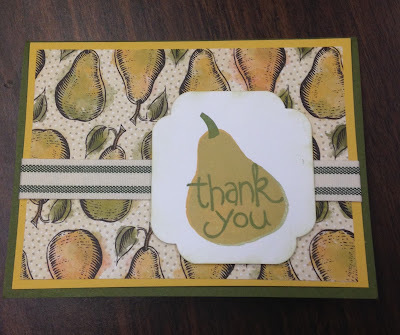 I really appreciate the ladies at my stamp classes who have been saying prayers and have been there for me. Thank you for understanding my absence, and hug your loved ones as often as you can. Each day is a precious gift. 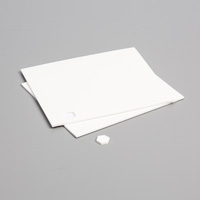 The Confetti Textured Impressions Embossing Folder creates a nice background for your card. 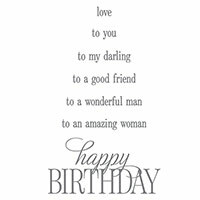 The opening is large enough to place your favorite sentiment, and by sponging a few colors around the embossing you get a colorful, happy birthday. 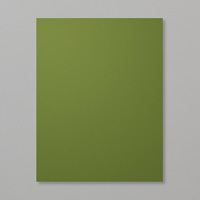 My card base is Mossy Meadow Card Stock that I layered with a piece of Whisper White. The colors I used on my embossed layer are Pear Pizzazz, Bermuda Bay, Lost Lagoon, and Crushed Curry. 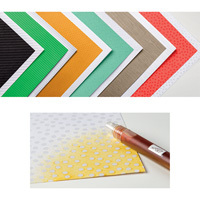 You can add any colors to suite the person receiving the card, leave the layer the way it is, or just sponge with one color. Another technique for this folder would be to ink the folder before running it through your Big Shot to emboss the color right into your layer, or you could use sponges to get a few different colors. A few stars added a bit more fun to the card. 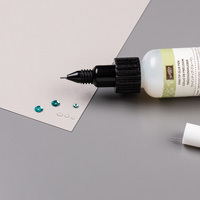 Tip: When adhering small embellishments, the Fine Tip Glue Pen works great. 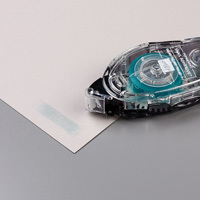 You can get just the right amount of glue needed without having left over residue. 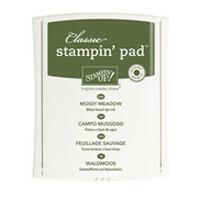 The unique cap design keeps it clog free too. Bear Hugs Video by Stampin' Up! If you were looking for a cute stamp set to help with not only your Valentine Cards, but also cards for Mother's Day, Father's Day, Birthday's and more, the Bear Hugs Stamp Set is perfect. 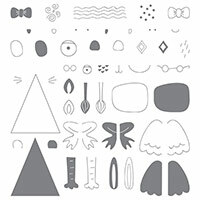 Watch the video made by Stampin' Up! to give you some great ideas and uses for the set. I will be posting my own card next week that I made for my Stamp Class, but in the meantime I hope you like the video and see how versatile this cute set is. 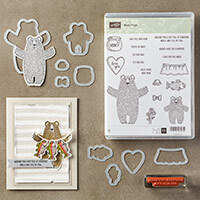 The Stamp Set and coordinating Bear Hugs Framelits Dies can be purchased together in a bundle to save 15%. I'm getting ready for my monthly stamp class, and with Valentine's Day right around the corner, I have been preparing Valentine Cards. The card I posted on Monday is from the same set as today's card. The Bloomin' Love Stamp Set and coordinating Bloomin' Heart Thinlits Die can be purchased together as a bundle to save you 15%. My card base is Real Red Card Stock and I layered it with a piece of Pink Pirouette and Whisper White Card Stock. I stamped my hearts onto the top layer, and added a piece of Crumb Cake 1 1/4" Striped Grosgrain Ribbon to the left side, and then placed a piece of Love Blossoms Designer Series Paper on top of the ribbon. 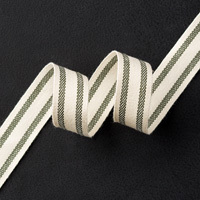 I liked the nice layer it created, and this wide ribbon made a nice border for the paper. The "Be Mine" sentiment coordinates with a framelit in the new Large Number Framelits Dies but mine has not arrived yet, so I just cut it out and placed it on top of the heart using Dimensionals.